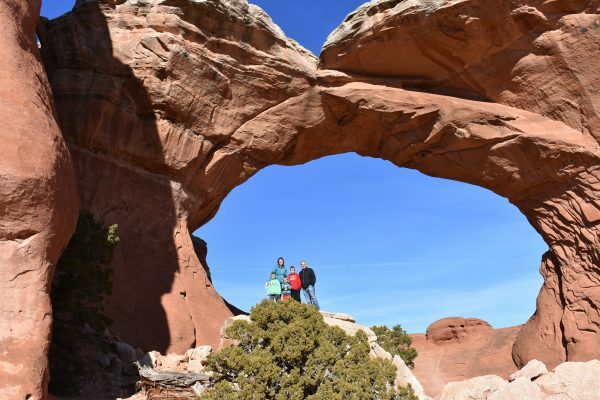 Broken Arch is a rarely visited, but beautiful arch in Arches National Park. 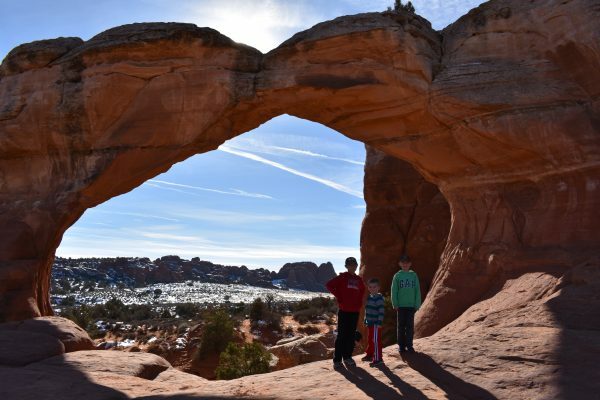 It shares a trailhead with the popular Sand Dune Arch, and the side of Broken Arch can be seen from where the trail splits. 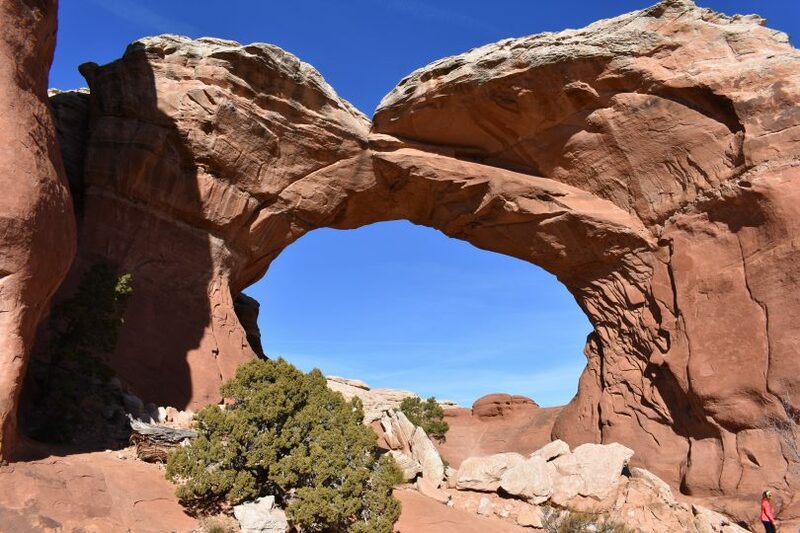 This arch also pairs beautifully, particularly if you have the option to shuttle cars, with Tapestry Arch. The trailhead heads east out of the parking lot, but splits after a dozen or so yards. 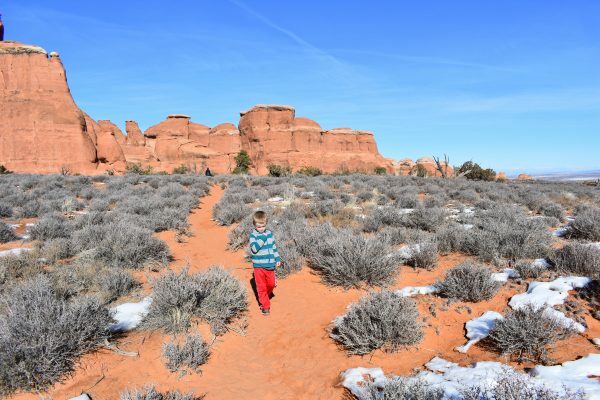 To the right is Sand Dune Arch, to the left is a longer trail to Broken Arch. (Incidentally, the arch isn’t really broken, but a large crack above it gives it that name.) From the split, the trail is flat and well marked for about three-quarters of a mile. It can be brutally hot because there is absolutely no shade. 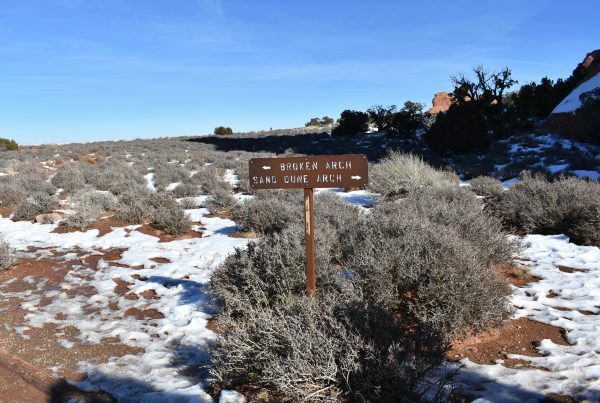 The arch is visible from the start of the trailhead. 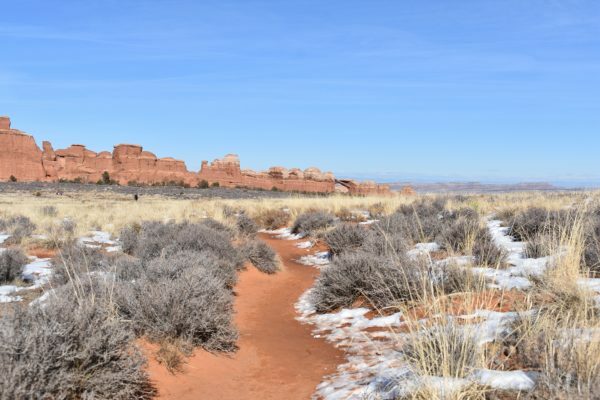 The trail to Sand Dune Arch comes up quickly. The trail is flat, but there is no shade. It was quite slushy in the winter when we visited. One cool thing about this arch is that the trail continues right through it. There are some great places for pictures, too. Be sure to continue through the arch and look back at it as the view from the other side is a bit different. Broken Arch is quite large, and it’s really fun to stand right underneath it. 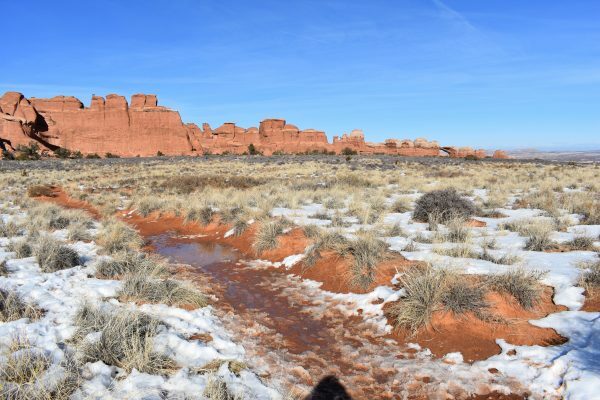 The trail is sandy and there are beautiful views of the rock formations along the way. There is one other trail junction, but it is well-marked. The trail is easy to follow and you can see the arch most of the way. Broken Arch is impressive to stand underneath. 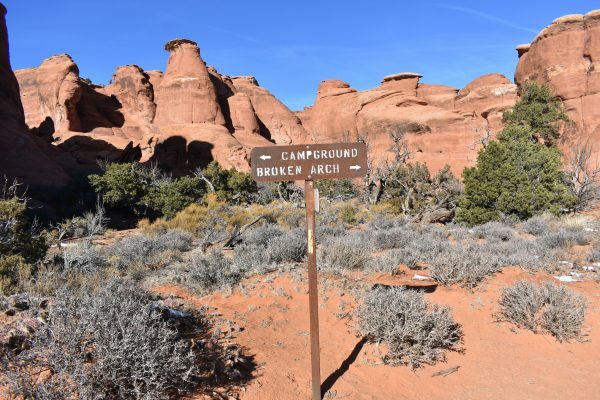 If you continue on the trail through Broken Arch, you will come to Tapestry Arch and the Devil’s Garden campground. Someone can pick you up there if you have enough cars for a shuttle. You can also walk to Tapestry Arch and back, but this makes the hike about 3.0 miles round trip. The trail is flat and easy the entire way, but it can be a little tricky to follow across some of the slick rock. Keep your eyes open for cairns. This is a view of Broken Arch from the other side. 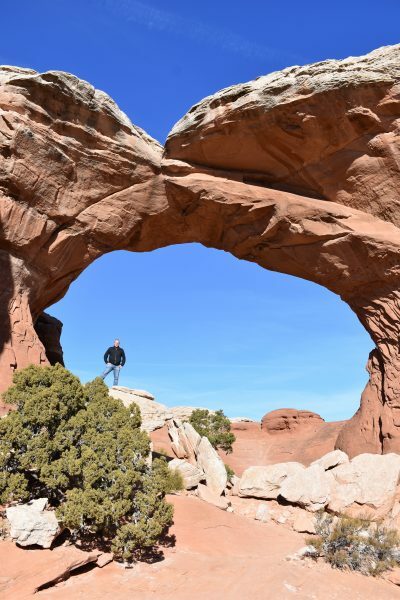 Don’t skip Broken Arch because it is “broken” or because you can see it from the road. 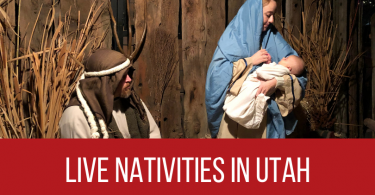 It is worth the short out-and-back hike to get there! 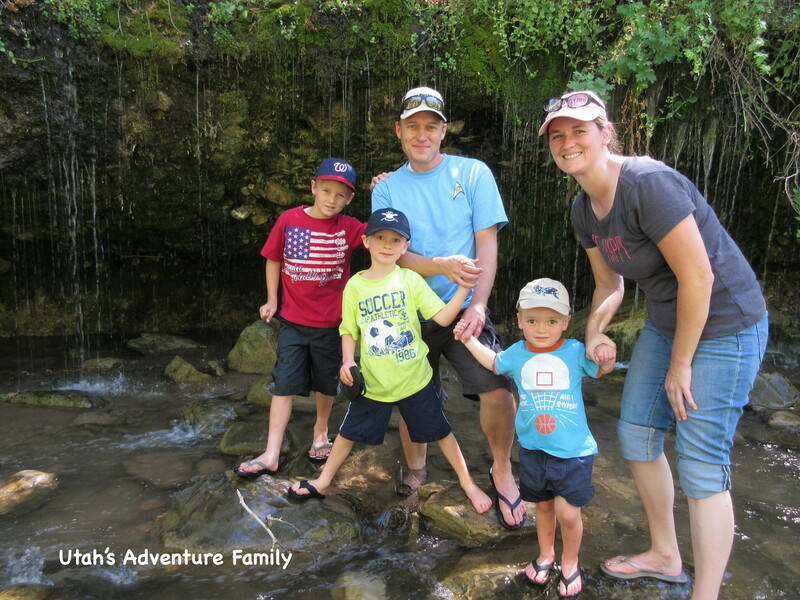 We love hiking in Arches National Park, and we have created a huge list of family friendly hikes in Arches. Broken Arch begins at the Sand Dune Arch Parking lot. Wear sunscreen and hats. 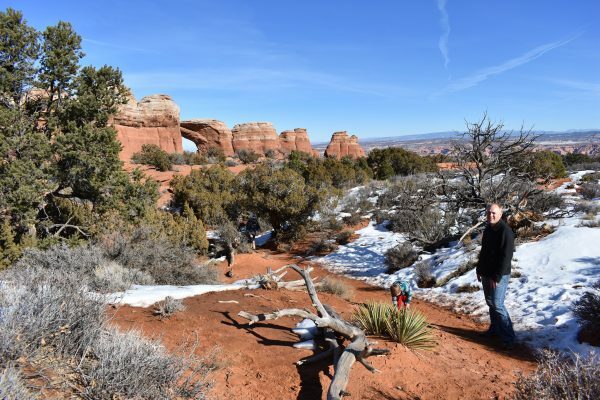 There is no shade on the hike to Broken Arch. 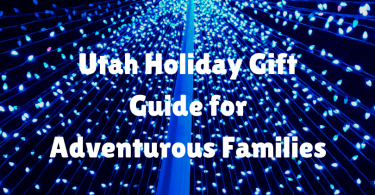 Make sure to hike to Sand Dune Arch, too. It is definitely worth the little side trail.